Quilt making for beginners is a fairly simple process. There is nothing like a quilt to add beauty and warmth to a room. Quilts have had appeal since the early centuries. Most people like them because they are beautiful to have around. You can make lap quilts, bed quilts, pillows, wall hangings, table runners and placemats to match your dÃ©cor. When I first started making quilts, I made them for all of my children, grandkids and family. They all got quilts and then I started making them pillows. Finally, I didnâ€™t have anyone else to give quilts to and I didnâ€™t want to stop. I give them away now to hospitals, for newborn babies, shelters (they can always use them) and fire departments for fire victims. There are organizations that love to get quilts to give away to needy people. Quilt making for beginners is based on the fact that you can give a lot of enjoyment to people, weather it be family or strangers. The best place to start is to look through quilt books for inspiration. Also check craft stores for material and even your favorite linen department to see what you like. 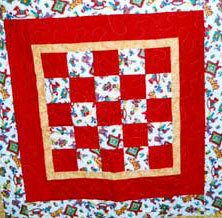 Quilts vary in size and the designs range from easy to very difficult. I have found that the best way to learn is to make a sampler quilt to begin with. You can pick and choose blocks, starting with the easy ones and then go on to make more challenging ones. Let's get started! What is your quilt going to be used for? Most people want to start out with a bed quilt. That is a big undertaking. The best thing to start with is a lap quilt or a wall hanging. Is the center of attention going to be your quilt? Do you want it to be the focal point or blend in with the surroundings? Bright colors will ensure that peopleâ€™s eyes are on your masterpiece. While a scrap quilt fits in with your homier dÃ©cor. Go to your favorite material shop and look for the colors your like. I also like to go to art and crafts shows and look at the quilts. Your eyes are always pulled to quilts with the most vibrant or pleasing colors. How do you choose those pleasing combinations? At least one fabric should contain your dominant and contrasting colors. The other colors you choose should harmonize with your color scheme but do not have to contain all the colors. The fabrics should range in values when you put them next to one another. The best tool you can have is a color wheel. It will tell you what colors go with each other. Remember warm colors advance, while cool colors recede. The dominant color is the most important color in the scheme and should be found in most of your blocks. The accent color creates contrast, and the blender color contains both colors in a pattern. Remember to start with something small and you can get the feel if you like quilting. I know once you start to quilt you will love it. You may be surprised at how well your beginning quilting projects turn out and how much fun it was. Check out the other articles that I have on quilt making for beginners. If you have any questions or comments please contact me and I will try and answer your question.